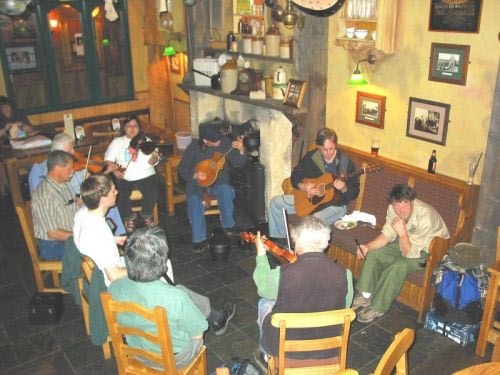 As I continue to spend most every Sunday afternoon at Fadó’s Irish Pub playing in the session, I become more aware of the great diversity and scope of traditional Irish instrumental music. To the un-initiated listener, all Irish music seems to sound the same (that’s so you can tell it’s Irish!). But listen carefully and you will appreciate the different types of tunes, their structures, melodic differences and styles. Here is a brief introduction and annotated discography of some traditional Irish music. Traditional Irish music is essentially dance music. It comes from an oral tradition and consists of melodic lines with many variations. The same tune can have many variations and may not be played exactly the same even when repeated by the same musician. A traditional tune printed in a book is not the real tune, but only an approximation of one of its many variations. The only way to really learn a tune is to hear it played by traditional players. It is a sort of musical language with many different accents, regional dialects, and ways of speaking. Most tunes consist of two parts. The first eight measures or ‘A’ part is known as the tune and is repeated, making sixteen bars. The second ‘B’ part is known as the turn and is also eight bars repeated, so the whole tune consists of thirty-two bars in two parts. The whole tune may be repeated several times with different variations. Since tunes are short, two or more tunes, usually of the same type, in the same or related keys, may be strung together into sets. Sometimes tunes may have more than two parts, but usually consist of eight-measure segments. The types of tunes reflect different dances. The most common are reels, jigs, and hornpipes. There are also polkas, airs and waltzes. They differ in rhythm and tempo. Reels and hornpipes are in 4/4 time, while jigs are in a fast three-time – 6/8, 9/8, or 12/8, and polkas are in 2/4 time. Airs are usually slow tunes based on songs. Reels are the most popular tunes played in sessions. They consist of lots of eighth notes, with a few quarter or half notes, usually played fast (dah-da-da-da dah-da-da-da). The hornpipe is similar, but is usually played more slowly with a distinctive bounce or swing to it (dah-da-dah-da dah-da-dah-da) . The jig is a very old dance and can occur in three types: a double jig, a slip jig, and a slide. Double jigs are most common and are in 6/8 time with two groups of three beats per measure (dah-da-da dah-da-da). Slip jigs are in 9/8 time or three groups of three per measure, and slides are in 12/8 time or four groups of three per measure. Each type of jig has its own distinctive type of rhythm, even though they are all constructed from repeated groups of three beats. Most tunes have names, which make them easier to remember. But the names are given for many reasons, none of which have anything to do with the melody. Sometimes tunes are named after a particular musician, for example, Cooley’s reel or Morrison’s jig. A tune may be associated with a particular place, such as the Galway Hornpipe, or named after anything at all, such as Lark In The Morning or I Buried My Wife And Danced On Her Grave. The whimsical names of many Irish tunes make for some interesting sets, such as My Darling Asleep/Tripping Up The Stairs/Haste To The Wedding. Often at a session, after a tune is played, no one can remember the name; that is particularly true as the evening wears on and more Guinness is consumed. After this all-too-short introduction, here are some recommended recordings to give you a good taste of the music. I buy most of my recordings at Dusty Strings in Fremont, which has one of the best local collections of traditional Irish music CDs. The Galway Trader in Ballard also has an extensive collection, and GaelSong in Ravenna has a more limited, but also good selection. Other CDs can only be purchased from Ireland. Tara Music is a good online source. There is a 2-CD set which I highly recommend as having a most varied collection of traditional Irish tunes (also songs), recorded live by many of the best Irish musicians on a variety of instruments. This is Gaelic Roots, live recordings from the Boston College Gaelic Roots Festival, produced by Kells Music. Gaelic Roots is one of the premier Irish festivals in America. The insert for this CD contains good information on Irish music and the performing musicians. The majority of my recordings are of traditional Irish fiddle music, since that is my instrument. For some reason the Pacific Northwest is home for many good Irish fiddlers. One of the best is Martin Hayes, who lives in Wallingford (Seattle) but is originally from Co. Clare, Ireland, where his father, PJ Hayes, was one of their best traditional fiddlers. Kevin Burke lives in Portland, but grew up in an Irish family in London with strong roots in Co. Sligo, Ireland. He is also considered one of the best traditional Irish fiddlers. Dale Russ is one of the best American-born Irish fiddlers. He lives in West Seattle and plays with a three-person band, Setanta. Randal Bays is another well-regarded American-born Irish fiddler who used to live in Seattle, but now resides in the Boston area. Anthea Lawrence, from Olympia, is also a highly-regarded local Irish fiddler. Below is a sample of their best recordings. Martin Hayes – 1993, Green Linnet Records, GLCD1127. Kevin Burke, Sweeney’s Dream – 2001, Smithsonian Folkways Recordings, SFW CD 40485. Setanta, Early Rising – 2002, Dale Russ, Hanz Araki, Finn Mac Ginty, Setanta 001. The Salmon’s Leap – 2000, Randal Bays, Foxglove FG0150CD. Fiddlehead, Anthea Lawrence – 1999, Fiddlehead Productions, Olympia, WA. James Kelly, Traditional Irish Music –1996, Capelhouse. The Star Above The Garter, Denis Murphy & Julia Clifford – 1969, Claddagh Records, CC5CD. An Historic Recording of Irish Traditional Music From Co. Clare and E. Galway – Paddy Canny, PJ Hayes, Peadar O’Loughlin (flute), Bridie Lafferty (piano), 2001, Shanachie 76001. Stewart Hendrickson is Chemistry Professor Emeritus – St. Olaf College, Research Professor Emeritus University of Washington, and in his new career, an unemployed folk musician (voice, fiddle, guitar; stewarthendrickson.com). Reprinted from The Victory Review, Sptember, 2004.